Argentina‘s Patagonia wine region extends between 33.3° and 33.8° South. Osorno Valley is Chile‘s most southerly wine region at latitude 40.5745° S.
Russia‘s wine region, east of Crimea is at approximately latitude 45.2699° N.
The wine region of Hampshire in England is around 51.0577° N.
China‘s Xinjiang province is around 43.7930° N.
BC‘s most northerly grape growing regions are Kamloops and Lillooet at ~50.6745° N.
Compared to almost all regions, Canada’s most northerly wine growing regions are only slightly south (~50km) of Hampshire, England, but we are significantly more polar than the other regions. There are 12,000 ha of vines in Canada, which may sound large, but it is less than Alsace (50,000 ha) and only 1/3 of Burgundy (49,000 ha) in vineyard coverage. We make less than 1/3 wine compared to New Zealand, which is a considerably smaller country than Canada. We are an emerging region, but now is the time that people are around the world are becoming interested in our wine; we will have the opportunity to experience our wines at the upcoming Vancouver International Wine Festival on February 11-19 2017, where Canada is the theme country. Jancis Robinson and Steven Spurrier, well-known wine critics, among others, have talked about how exciting Canada is for wine. You should be too. 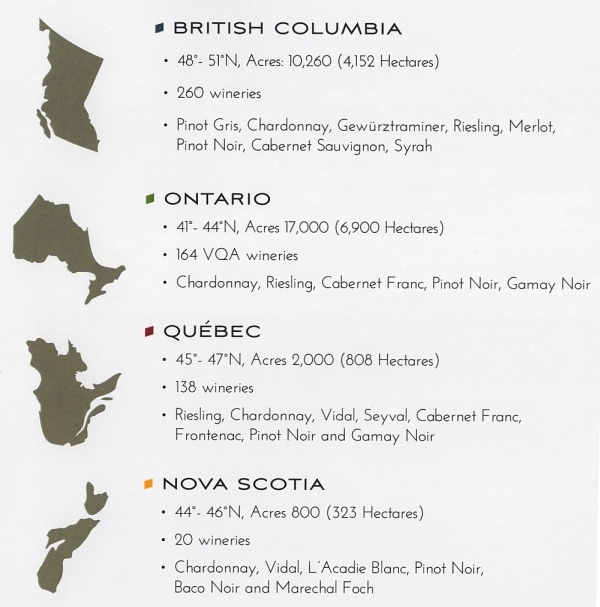 Did you know there are 670 wineries across in Canada, or that there are 280 wineries in BC? Did you know that Canada is the largest producer of ice wine in the world? There are lots of things to celebrate about Canadian wine. We produce wine in BC, Ontario, Quebec, and Nova Scotia. It has been difficult for us in BC though to try wines from other provinces. There has been efforts by provincial governments and the federal government to remove barriers and let us experience all our wines. Each of our provinces, with their own unique climates, are becoming known for certain grapes or wine styles. BC for example is known for Pinot Gris and other aromatic whites, Syrah and Pinot Noir. Ontario is well-known for Chardonnay, Riesling, Pinot Noir and Cabernet Franc. Quebec for Vidal, Frontenac and other hybrid crosses. And Nova Scotia for the L’Acadie grape and its specialization in sparkling wines. At the Vancouver International Wine Festival, we will get a chance to try some wines from Ontario and Nova Scotia which you may not otherwise have a chance to try. 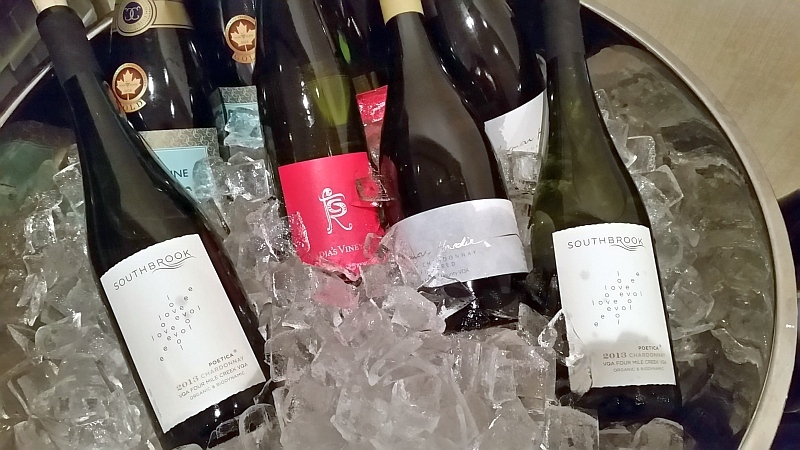 I had a chance recently to try some wines from Nova Scotia and Ontario, as well as from BC, that we may see at the Vancouver International Wine Festival. The wines from Nova Scotia, coming from quite a cool climate due to its proximity to the cold Atlantic Ocean currents, shows off their fresh, crisp, bright style. I tried 3 different sparkling wines, 2 white still wines, and one red wine. 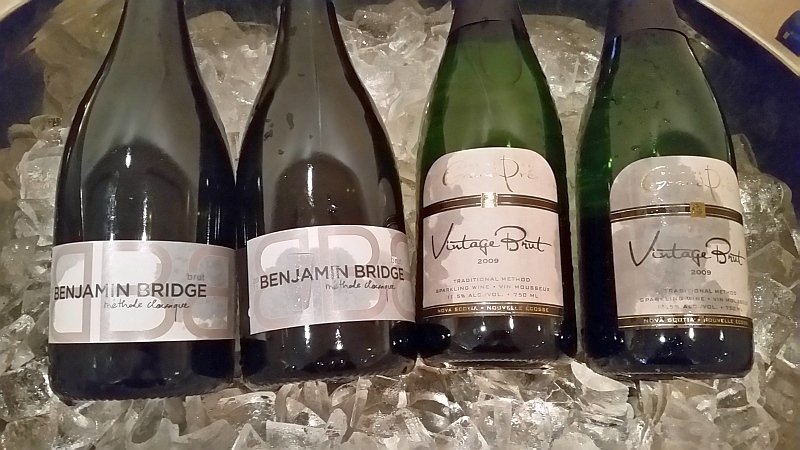 The sparkling wines: Domaine de Grand Pre, Vintage Brut 2009, and Benjamin Bridge, Brut 2011 showed off the quality from Nova Scotia grapes. The Domaine de Grand Pre Vintage Brut 2009 (made with L’Acadie Blanc and Seybal Blanc grapes) had juicy tropical fruit and apples on the nose. The apple flavour continued on the palate, and you get a medium bodied, clean crisp fruit flavour along with small creamy bubble. The Benjamin Bridge, Brut 2011 is made with 100% Chardonnay grapes. It had a toast, apple,citrus nose. High acidity, medium body, light creamy bubble, with flavours of apple and a hint of floral. Two interesting wines to enjoy at the Festival. If you are a fan if Riesling like me, you may want to try the Gaspereau Riesling 2015, which comes across with stone fruit and lemon rind on the nose, followed by tart apple, and citrus on the palate. I think this wine will age very well and become quite a catch for those who cellar their wines. A peculiar wine that I tried was the Selkie Rose Frizzante, a sparkling rose wine, made with a blend of mystery grapes. I think the winery wants you to enjoy it more than analyze like I am doing. This off-dry sparkler had an interesting nose of sweet red fruit, combined with Jasmine incense. This jasmine component carried on to the palate along with other red fruits and cranberries. The wines from Ontario are mainly grown in Niagara-on-the-Lake, the Niagara Escarpment & Twenty Valley, Lake Erie North Shore & Pelee Island, and Prince Edward County appellations. There are differences in the soils such as the limestone along the Niagara Escarpment compared to the sandy / silty soils for the Niagara-on-the-Lake appellation. Differences in soil do result in differences in wine. As I mentioned Pinot Noir, Cabernet Franc, Chardonnay and Riesling are very well-known grape varieties producing quality wines in Ontario. During our tasting we had a chance to try some of these wines. A few wines that I liked in particular was the Henry of Pelham Cuvee, Catherine Carte Blanche 2011 (sparkling), Flat Rock Cellars, Nadja’s Vineyard Riesling 2014, Tawse Winery, Cheery Ave, Pinot Noir, 2013, and the Vineland Estates Cabernet Franc, Briar Creek 2014. The sparkling Henry of Pelham Cuvee had nice stone fruit, bruised apple and toasty nose. Dry, high acidity, with very small creamy bubble Some stoniness, spice and apples on the palate. The Flat Rock Cellars Riesling has a pretty lychee nose with hint of sweet spice. It’s off-dry, medium acid,with a light stone fruit flavour, and honey. Tawse Winery Pinot Noir is VERY nice. Cedar, vanilla and red fruit nose. Medium body, fine tannins, raspberry, bright red fruit, oak and sweet spice. Good fruit, acid, and tannin balance. Very elegant! The Vineland Estates Cabernet Franc showed some capsicum, mixed in with the red fruits on the nose. Very light mouth feel with red cherries and light spices. Tannins firm up on the finish. We of course here in BC are the most familiar with our own wines. To round out the tasting we did have the Meyer Family Vineyards Brut sparkling wine, Tantalus Riesling 2015, Moon Curser Arneis 2015, Quails’ Gate Rosemary’s Block Chardonnay 2014, 50th Parallel Estate Pinot Noir 2014, Bartier Bros Cabernet Franc 2013, and Laughing Stock Perfect Hedge Syrah 2014. The Meyer Family Vineyards Brut sparkling wine is the first release for them. It has a mix of ripe apples and stone fruit on the nose. High acid with tiny bubble; citrus and apple flavours with some creaminess from the lees contact. 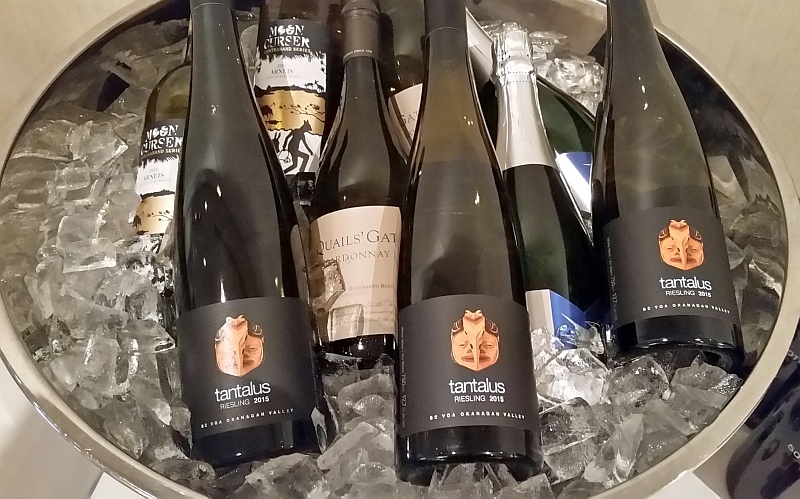 You can’t go wrong with Tantalus Riesling. Lime, lychee, peach and flowers on the nose. Off-dry, high acid, with flavours of green apples, lime and stone fruit, along with a hint of petrol. If you like a big, ripe fruit white wine, the Quails’ Gate Rosemary’s Block Chardonnay fits the bill. Lots of tropical fruit aroma and flavour, along with toasty oak. Full viscous mouth feel. Being a Pinot Noir fan, I would recommend you try the 50th Parallel Estate Pinot Noir, with its mix of tea leaves and some may also say some sacred herb, and red fruits on the nose. More red fruits, floral and tea leaves on the palate, with a hint of herb. Light mouth feel, fine tannins. An excellent wine. Lastly a wine I thought rated 5 stars in my rating scheme was the Laughing Stock Vineyards Perfect Hedge Syrah. Floral, orange, vanilla, ripe dark fruits and more on the nose.More ripe dark fruit on the palate, together with violets, nutmeg and pepper. Very intense flavours. Expressive and memorable. You may want to try all of Canada’s sparkling wines presented at the Festival, or compare other grapes like Riesling, Chardonnay or Cabernet Franc. See how BC vs ON vs NS sparkling wines taste, smell, and feel different in your mouth. Is there one region you prefer, or do you like them all? Some things for you to try at the Festival. Remember Canada is cool!